Meet Heather and David from Kippins. Kippins is a classic startup tale ‒ borne from a mother’s need for a good night’s sleep. Heather Rowland started the business from her home in 2014 while on maternity leave. The idea: to create fun, snuggly blankets to soothe her children and spark their imagination. Social media hype grew quickly. Her husband David is now onboard with Kippins, looking after the finances. Together they’re raising two young sons and a burgeoning international business. Kippins’ cuddle blankies each have a unique animal character and fairytale behind them. Now their range has expanded to clothing, toys and storybooks ‒ all sourced from organic, sustainable materials. Sendle caught up with Heather to unpack the Kippins magic. How did Kippins get started? What were you and David doing beforehand? Before Kippins, I worked in advertising and marketing for ten years, first as a copywriter, then a branding specialist. David was in the aviation industry as an Aircraft Maintenance Engineer. The idea for Kippins came when I was looking for a comforter for my eldest son. 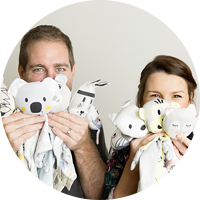 I’d heard they were a great tool for helping your baby settle to sleep when they reach seven months (...and separation anxiety starts). The more I read, the more I learned about the psychological benefits of giving your child something to attach to. I wanted one which had a cool story to go with it, as I remembered from my own childhood that those moments in bed reading with my parents and cuddling my friend were some of my happiest memories. I couldn’t find anything that combined a cool story with modern toy design. Kippins brings it all together, with sustainable and eco-friendly production as a bonus. We started the company in our lounge room with meagre savings, and it grew so quickly, including several productions that sold out in weeks. I never went back to my day job. David joined the business full-time in March of 2016. 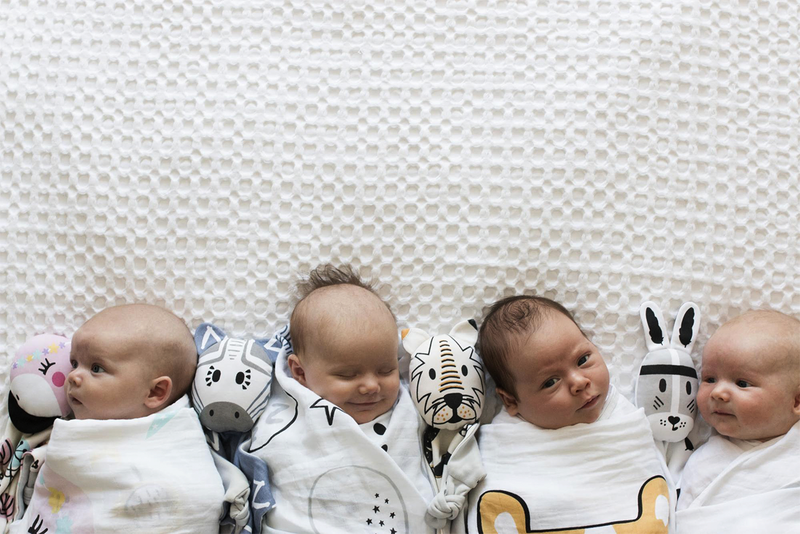 Now, Kippins has grown to be a full range of cuddle blankies, wraps, rattles and more, stocked in 38 different countries. Your products are organically produced. How important is social responsibility as a driver of success? The truth is: I didn’t set out to have an organic label. But when I started to research manufacturing, I learned that even ‘natural’ cotton is a water-intensive, pesticide crop and that the impacts on the surrounding communities can be devastating. Plus, some of the "approved" materials in children’s toys would make you gasp. Companies can follow a certain country’s labour laws, but this doesn’t mean that it’s a standard we find acceptable on home soil. With this in mind, I felt compelled to produce using organically grown textiles and ethical production methods. Our supply chain is completely traceable, from the moment the seed is planted in the soil to your child’s hands – we use the GOTS certification which is one of the most stringent in the world. The consumer is getting very savvy in their ability to assess how ethically and responsibly things are produced. We’ve seen it happen in the beauty industry and I believe that fashion/textiles aren’t far behind, so it’s not only being a responsible global citizen, it’s also smart business. You run the business from your garage, essentially. Working from home, is it tough to make a clear distinction between where work starts and finishes? Well, the first adjustment has been that our garage hasn’t had a car in it for a couple of years now! We have a home office and showroom setup so that we can officially close the door at the end of the working day if we like. However, when it’s your own business, there really is no ‘off’ switch. As we work with overseas markets, we’re on a bit of a 24-hour schedule. When the Australian market closes, another is starting. It can feel relentless. We do set boundaries, particularly as we have two young boys (3 and 5) and they deserve our time and attention. We truly love our business and we’re passionate about growing it, so having a ‘more than’ full-time job is part of that and we’re willing to put the work in. While it’s a busy schedule, it also means that we’re not tied to a 9-5 work day, so we get to spend lots of time with our boys. Technology also means we can work from anywhere. 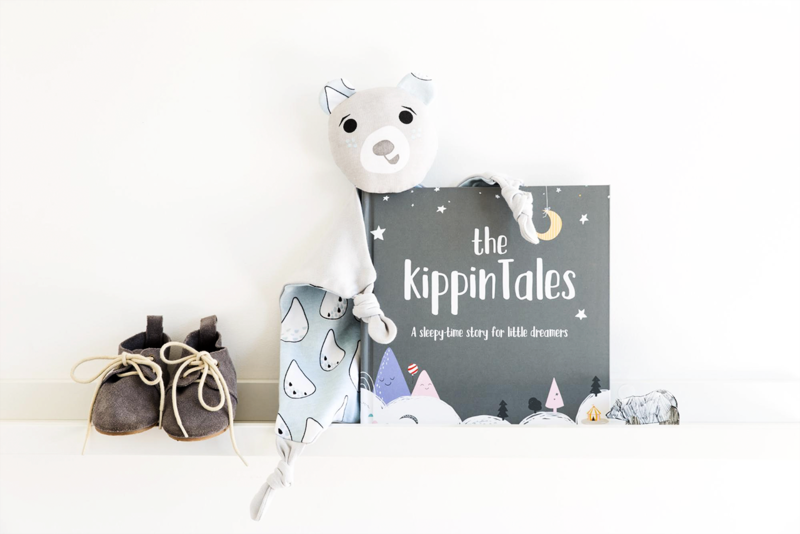 Kippins integrates its blankets with stories around each character. What books shaped your childhood? Enid Blyton, Roald Dahl and Lewis Carroll. I loved those big, bold stories in magical worlds. What are your key day-to-day challenges? Definitely time management. When you’re a new company you wear a lot of different hats. It must be a steep learning curve, getting to grips with a new business from end-to-end. What have you picked up along the way? Oh gosh, when I started I had no idea about the production and manufacturing of textiles! I had zero idea of how to make an idea into a physical product. That was a huge learning curve. I now know my way around different methods of construction, printing and finishing, developing technical packs... you name it. How have you found Shopify and ShipStation as an e-Commerce/shipping combo? Finding technology that automates our processes has been a major turning point in our efficiency. Customers want their products delivered quickly and they want to be able to track it. Just three years ago, we were receiving orders, handwriting labels and physically lodging them at the post office. We weren’t able to send customers their tracking details unless we did so manually. With the volume of orders we receive today, there’s no way we could manually write them out. Using Shopify and ShipStation means our labels are automatically printed using the exact address our customer has used (and flagging any errors). This means we can quickly dispatch our packages with much less room for error. What tangible benefits does Sendle give you? The parcel tracking is fantastic – the customer feels secure as they can track their package and it means we’re spending less time communicating with them. Also, because Sendle integrates seamlessly with our website, the entire dispatch process is automated. This saves us time manually processing orders and means we can ship packages much quicker. Everyone loves getting their package in a flash! We’re growing our range this year and introducing some exciting products all centred around nap-time, for kids of all ages. We’re also exploring how we can integrate technology and animation with our books. We’re looking forward to continuing to grow our brand this year with the appointment of some new team members and a move to an off-site facility (so we might just get those cars in our garage, after all!). Don't spend on unnecessary overheads. Kippins run their entire operation from their home garage. This is everything from administration to marketing to courier dispatch. It's a full-suite production line, and they keep costs low by having it all in-house (literally). The future of e-Commerce is business, powered virtually. Have a think about what you could bring closer to home to cut on costs. Sendle customers get a free upgrade to Premium when using Sendle via ShipStation. Easily add your e-Commerce store and manage everything from the one account. Click here to view the offer. Images courtesy of Heather and David Rowland from Kippins. Home can be a haven, a delight, a little slice of heaven (if it’s done right).